SINGAPORE: The Kuala Lumpur-Singapore High-Speed Rail (HSR) project will have several short-term environmental concerns, but the long-term benefits on commuter safety and carbon emissions provide a "strong justification" for the project, an environmental impact assessment report showed on Wednesday (Dec 27). In a report commissioned by MyHSR Corporation, the group responsible for the development and implementation of the project, it was noted that air, water and noise impacts, soil erosion and sedimentation are among the short-term environmental concerns. Among these concerns are also carbon dioxide emissions that will be generated from the burning of fossil fuels to provide enough electricity to power the HSR system. By 2060, 646,000 megawatts hr/yr of electricity is needed to support the HSR system. This hourly figure is about 140,000 times the electricity per capita consumed in Malaysia in 2014. When operational, the HSR will offer three services - the Kuala Lumpur-Singapore direct service , a one-stop service from Iskandar Puteri to Singapore and a domestic service stopping at seven stations - and operate between 6am and midnight daily. However, the report added that mitigating measures have been put in place to ensure that these environmental effects do not adversely affect people. For example, pathways used to transport soil and biomass will not be located near residential areas. The report also added that "the duration of the construction period is relatively of short term" and that the "impacts will be intermittent". As a result, the findings from the study indicate that "on an overall basis, the HSR project is expected to induce net positive environmental impacts" the report said. Annual ridership is expected to reach about 15.2 million in 2030 and increase to 37.8 million in 2060. These ridership figures will translate into fuel and carbon dioxide emissions savings, the report said. It is projected that by the 10th year of operation, about 19 million litres of fuel will be saved from fewer vehicles on the roads. Additionally, the electric-powered HSR will reduce greenhouse gas emissions from vehicles and this can amount to up to 55 million kilograms of carbon dioxide emissions saved. With the HSR, commuter trips between Kuala Lumpur and Singapore will likely be serviced predominantly by the rail service, rather than by air or cars, the report said. Hence, commuter safety is also expected to improve. The report stated that 6,872 fatalities were recorded on Malaysian roads in 2010, especially during festive seasons with high traffic figures. As commuters switch to using the HSR instead of driving, this could "reduce the exposure of commuters to safety incidents with significant benefits to the economy and society". However, the report does take into account that although certain impacts are mitigated in the long run, social impacts may extend into the future as well. The HSR alignment is set to start from Bandar Malaysia Station in Kuala Lumpur and pass through Putrajaya, Seremban, Malacca, Muar, Batu Pahat and Iskandar Puteri before terminating in Singapore. As such, eviction and relocation of businesses and households in these areas may take place, said the report. A social impact study has been commissioned to assess the impacts and potential social benefits of the HSR. Despite the short-term and long-term negative impacts, the Malaysian government believes there is "a strong justification" for the HSR as it will "contribute significantly towards the country's future economic growth" and help transform Malaysia into a "high-income, developed nation". In order to achieve the World Bank's requirements for a high-income nation, Malaysia expects to raise its per capita income from US$6,700 to US$15,000 by 2020. Furthermore, the HSR is also expected to create 111,000 jobs. In terms of convenience, commuters can enjoy an increased speed of travel between cities, especially cities in the south-west coast of the Malaysian peninsula. Additionally, pick-up and drop-off facilities for passengers will also be included at the HSR stations, allowing easy access for passengers arriving or departing by buses and taxis. 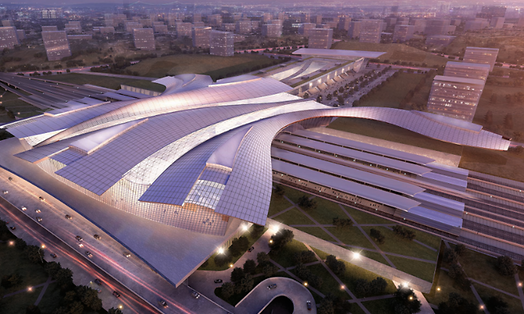 Those driving will also have about 8,400 parking facilities across all Malaysian stations. The HSR, slated to be ready by 2026, is also expected to shorten the travel time from Kuala Lumpur to Singapore to 90 minutes.